This podcast episode is a bit different. I spend a few minutes telling the story of my 2018 Boston Marathon experience. I'll let you listen in for all the details, but the marathon did not go as expected to say the least as I ended up in a medical tent at mile 22. 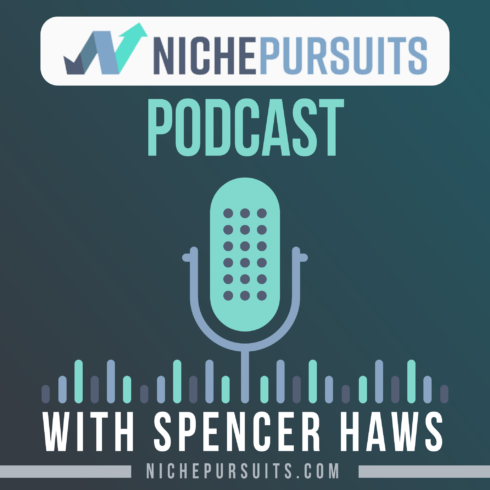 I've learned some valuable life and business lessons from this experience and I share those throughout the episode. In addition, I dive into the March update for Niche Site Project 4. I share most of the details I documented here. If you enjoy the podcast and want to see more episodes like this, please do me a favor and write a review on iTunes here. Thanks again! So there I was at Mile 22 in freezing rain, falling onto the cold, wet pavement. I was 22 miles into running the 2018 Boston Marathon and I had just severely sprained my ankle after stepping into a small pothole filled with water. My ankle was throbbing with pain and hundreds of marathon runners were passing me all around. Luckily, I had a friend nearby that was able to help me up and I to hobbled over to a nearby medical tent just 100 yards away. I had tried for years and run 10 marathons to try and qualify to run the Boston Marathon. When I qualified, it was the pinnacle of my running career. I had envisioned running the Boston Marathon as a big celebration and an achievement I can be proud of once I cross that finish line. However, here I was sitting in a medical tent asking them to please tape up my ankle so I can go finish the last 4.2 miles. As the medical personnel were wrapping up my ankle, it only took them a couple of minutes to realize that something was a much bigger problem than my sprained ankle. I could barely hold a cup of warm broth because my hands were shaking so much. I couldn’t stop shivering and chattering my teeth. My lips were blue. The medical professionals took my temperature. I had hypothermia. They told me I should probably not finish the race. My good friend agreed I should quit. So, there I was, the coldest I’ve ever been, just four miles from my goal and everyone around me telling me it was time to pack up and go home. After hearing everyone’s advice, it took me only a split second to decide exactly what I needed to do. I was going to finish this race and I didn’t care what anybody else had to say about it. I’ll share the rest of my Boston Marathon story in just a minute. But first, I want to give you an update on Niche Site Project 4. 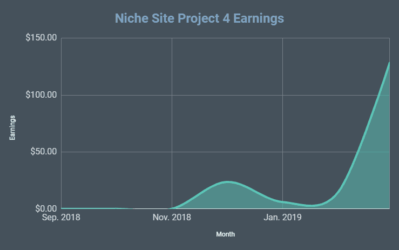 I began my niche site for Niche Site Project 4 roughly seven months ago in September of 2018. As with any niche site, I know it’s going to take a few months for things to start picking up in Google and certainly for the site to start earning very much. After the site earned $24 in December, I thought things would just keep going up from there. However, my site was still not getting much love from Google and in January I earned just $6. Ouch. Then February was just $15. Double ouch. I felt like I just hit a pothole and sprained my ankle during the marathon. Not earning much from a site that is so public is painful. I had comments from people telling me that Niche Site Project 4 is a flop and that I’m doing it all wrong. Maybe I should just quit and go hide in a cave somewhere. Well, towards the end of February, a small miracle happened. I started to see my daily traffic from Google increasing. By early March, I could see that my rankings were increasing basically across the board. Again, it was nothing huge but over about a two-week period, my site went from getting about 5–10 visitors a day from Google until about 40 or 50 organic visitors a day. Then my organic traffic doubled again over the next week or two. By the end of March, my site was getting around 130 visitors a day on average just from Google. The total traffic to the site is about 300 visitors a day, with a big chunk coming from Pinterest as well. Here’s my monthly report for March of 2018. My earnings from February to March increased eightfold. It went from earning roughly $15 in February to $128.41 in March. I made about $89 from the Amazon Associates Program, the balance which is roughly $40 from Ezoic ads. It’s like Google AdSense but it’s display ads. In terms of raw numbers. The total articles that I added during the month of March was 15 and most of these were buying guide, best product review-type articles. 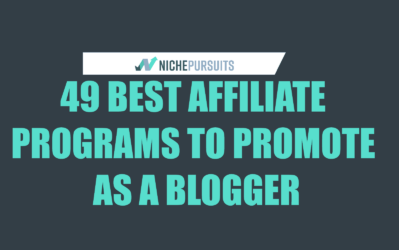 They’re very typical Amazon affiliate keywords and they are usually in the range of 3000, maybe a little over 3000 words long, somewhere between 2500 and 3500 words long. It’s a typical article that I’m publishing. However, overall I published 107 articles on the site since September. Many of those articles, almost half, maybe closer to 40% are informational type articles. A lot of these are very image-heavy. As I mentioned, I get a lot of traffic from Pinterest. I’ll maybe list 25 ideas of something and each idea has an image associated with it. These articles are closer to 1500 words long. It’s sort of the average for that. Sometimes, they go maybe 2000 words. Informational articles shorter, the buying guide articles are much longer. In terms of traffic, like I said, things really started to pick up from Google. Really, I just think it has to do a lot with age. Yes, I’ve added a lot of content and that helps, but finally my site has gotten out of the sandbox, it’s more than six months old, just getting that love from Google. There really was a large spike in terms of traffic from Google. Overall from Google in March, my site got just shy of 2500 unique visitors, then social media traffic, most of that from Pinterest was about 2800 visitors, and overall the number of total sessions in March was about 6500 visitors. By the end of March, my site is getting a little over 300 visitors a day, maybe on average there. Some days are a little less, some days are a little bit more. What did I do during the month of March that help my site so much? I don’t think it was anything specifically that I did during the month of March. I just think it’s a cumulative effect over the past six or seven months really working on the site. Age has a lot to do with it. I finally got out of the sandbox. I’ve been doing things right all along, meaning that my articles are keyword-focused, they’re targeting those low-competition keywords, but sometimes it just takes time. The other thing that I have been doing a lot more of in the past two to three months is link-building. I’ve been doing a lot of outreach for guest posts. During the month of March it looks like I’ve only got about three guest posts. I’m hoping to get another five or ten each month for the next few months. But yeah, did some outreach, got some links there. In previous months and a little bit in March, I’ve done something called link swaps. If you didn’t read my blog post update, essentially what that is, is I reach out and I asked for a link to my niche site. In return, I basically explain, “Hey, I’ll give you a link to your site from a different site my mine.” So, there’s three websites involved, two of which I own. I reach out to somebody, they link to my Niche Site Project 4 site and then I link to their site with XYZ site that I also own. It’s kind of a three-way linking thing. It’s not something that I would recommend doing heavily. I wouldn’t do this as your primary link-building strategy but it was a great way for me to pick up about 10 links. I think I’ve got a total of about 10 links from some good sites. I don’t plan on doing that anymore going down the road. Maybe a little bit here and there. I’m talking two or three links here and there over the next six months. But I’m basically done because I don’t want my overall link profile to be all of these link swaps. If Google were to see all of these, they could be devalued and that wouldn’t be good. I’ve done a good mix. I’ve done a lot of blog commenting in the past. I’ve done a couple of resource linkages, not very much, about 10 link swaps here. I’ve got a few guest post links that I’ve done through my own outreach, and then something also new that I’ve done is I have tried a couple of link building services. I used Authority Builders by Matt Diggity, that he started a little while ago. He’s well-known in the SEO space. He has a service called Authority Builders. authority.builders is where you can go for that. 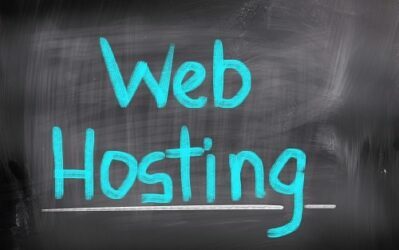 Basically, they have a database of sites that are willing to do guest post for you. I had three keywords that I was targeting, got a couple of links through Authority Builders to each of those articles, and I tracked my ranks all along the way so that I could see if there was any movement in the surfs because of those specific links. Keyword one that I tried through Authority Builders was ranking 32nd in Google on March 5th. After just getting two links to that article on April 7th of 2019, it is not ranked 6th. It moved up 26 positions, something like that. Huge movement in the surfs obviously can be attributed to those links. So, I’m very happy about that. Keyword number two went from ranking 19th on March 5th to 10th on April 7th. Again, just two links I’m very happy with that. Hit the first page. Keyword number three was ranking over 100 when I started the experiment, and afterwards it’s still ranking over 100. It was a very difficult keyword. It’s just because the competition is so high there I don’t think it has anything to do with the links. I’ll maybe keep building some links there. It’s a very high-volume, high-competition keyword but we’ll see how that goes. It doesn’t really matter probably if I ever rank for that because I’m targeting so many other keywords as well. If you want to check Authority Builders out, you can go to nichepursuits.com/authoritybuilders. You can go and view the types of links available, the cost, and how their service works to get those guest post links. The other service that I tried that I don’t have any results yet to report on was The HOTH. I went ahead and used their service to order a three-link package. They’re just outreach links where they outreaching the guest posts. I ordered it on March 6. It’s now a month later and they’re still working on it. It’s still in progress. It takes a really long time. I’m not very happy about the turn-around time there, but I can’t report on it if the links are good enough because I haven’t got any links. In addition, something that I’ve started actually in February was building an email list. Right now, I have an opt-in form that pops up after people visit my site after five seconds. I’m using OptinMonster to do that and I collect the leads I used ConvertKit for my email service. Right now, I only have one autoresponder email that goes out. So, that’s the goal that I have over the next month, to build out a much longer autoresponder series so I can drive traffic back to my website and have people click on my affiliate links so I can earn more commissions or click on other ads so I can have some money there. Right now I’ve got 51 people on my email list that I’ve gathered over the last month. It’s nothing stellar, nothing crazy, but I do have that started and hopefully I can build that up over time. Going forward, my next plan for the site, I’m going to continue to post between 10–20 articles a month, to keep just cranking up that content. There is so much potential in this niche. I just want to grow it as much as possible. And then like I said, I want to build out a longer email autoresponder series. I can start monetizing that email list better. I hope to build another 5–10 guest post links a month through my own outreach. We’ll see how that goes. I’m using an author, I’m using a virtual assistant to help me with this outreach. Hopefully, I can get a few. I do know that in April I’ve already got one. Hopefully, I can nail at least four more. I found that a lot of people do a Google search, they just quickly want to see what the top products are. If you provide that for them right at the first in your article, they may not bother to read the 3000 words that you’ve written and that’s fine. I just want people to come, I want them to click on my Amazon affiliate link so that I can earn a commission there. But if they want more information, I have written that 3000 words that they can read and digest for themselves. I have found that a lot of people are clicking on those Table Labs links. 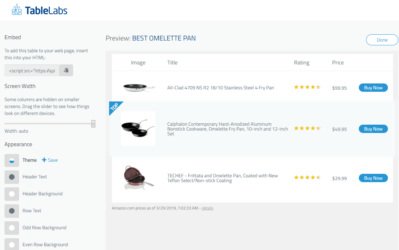 And just you know, if you go to tablelabs.com, of course this is my product that I created to create those Amazon affiliate shopping comparison tables. I’ve reduced the price quite a bit. If you go there, you can get a great deal right now on Table Labs. So, go ahead and check that out tablelabs.com. The final thing I plan on doing is applying to Mediavine as soon as I’m able to. I know that I’m going to have a higher earnings per visitor than I do with Ezoic ads at least through my own experience. I’ve used Mediavine on a couple of other of my sites. The RPMs, the earnings per visitor, is much higher than Ezoic or other display ads that I’ve done. I’m hoping that this month I be getting enough traffic. You have to have a minimum traffic to apply to Mediavine. That is in my plan for the near future. As exciting as $128 is in earnings, what is really exciting is the earnings for April and the growth trajectory that I already have. During the first eight days of April as of recording this podcast, I’ve already earned more than $128. I just eclipsed that. I’ve earned roughly $130 during the month of April already for my site. If we were to keep on that same track for the month of April, it would earn about $400. I don’t think it’s going a quite hit $400. I have some really good Amazon days but I could be wrong. I don’t know. If I were to predict and be a betting man, I would say it’s going to come in between $300–$400. But if it eclipses $400, I’m going to be super happy. That would be excellent. The exciting thing is the growth trajectory. I’m seeing growth week after week. More and more traffic is coming from Google. My earnings are increasing. So, Niche Site Project 4 is not a flop. In fact, things are just starting to get interesting. I don’t know exactly when I’m going to reveal the site. At some point that will happen. I don’t know if that will be when I start making $500 a month, $1000 a month, or even longer. I’m doing some polling on the Niche Pursuits Facebook group to get some opinions, but I will continue to share all the steps, all the strategies, all the progress that I make for the site whether or not you know the domain publicly. Maybe it doesn’t matter at all. I’m going to share my specific strategies, so hopefully you can apply that to your own sites as well. 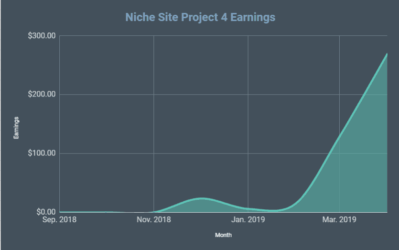 That is my monthly report for March 2019 for Niche Site Project 4 site. Hopefully, you picked up a few strategies there and that you see the value in the project overall. Even though Niche Site Project 4 has been rough in the beginning, I’m starting to see a light at the end of the tunnel. Sure, $130 is nothing to retire on or write a letter to grandma about, however the growth trajectory is significant at this point. I hit the dip like tripping and following because of the pothole along the way, but I’ve kept going. If you’ve quit a project after you started something after just a couple of months, you probably didn’t give it long enough to see if it truly could be successful. Maybe it’s time to pick yourself back up off the pavement and start putting one foot in front of the other. Who knows where it would lead you. Now, I’d like to finish the story of the Boston Marathon that I’ve ran last year. I was at Mile 22 in a medical tent after severely spraining my ankle due to a pothole that I misjudged. However, worst than the ankle was that the medical staff had discovered that I had hypothermia and that they’re recommending that I quit the race and go home. As I would later find out, one of the symptoms of hypothermia is loss of dexterity in your extremities, which is likely what caused me to misjudge the pothole and sprain my ankle. My wife thinks it was a blessing in disguise and I tend to agree that I stepped in that pothole and sprained my ankle. My body was starting to shut down due to the hypothermia and I’m honestly not sure what would have happened to my body had I kept running in the extreme cold and rain. The most extreme result of hypothermia is death. I would also later find out that thousands of marathoners had to drop out of the race that day due to hypothermia, including many of the elite professional runners. The 2018 Boston Marathon was the worst combination of weather it had ever seen. Temperatures in the mid-30s, extremely cold, heavy rain, and lots of wind. The cold, by itself, is not a big deal. I’ve run a marathon in colder weather. But when your body is soaked to the bone, combined with the cold wind it becomes much more difficult to stay warm. After they took my temperature and told me it was time to quit, I didn’t even have to give it a second thought. I came to run the Boston Marathon and I didn’t care what obstacle got placed in front of me. I was going to finish the Boston Marathon. I was very direct and clear to everyone around me. I’m finishing this race no matter what. Once they saw my determination, they said they would allow me to run it if I can get my temperature back up to 98 degrees. The medical staff did everything they could to dry my clothes and warm me up. I had hot packs under my arms and legs, and was wrapped in blankets. I was given warm chicken broth to drink. When your body is cold to the core, it can take a while to warm back up. I was in that medical tent for over an hour before my body temperature finally got above 98 degrees. I wasn’t going to set any personal records with my marathon time, but I was given another opportunity to finish the race. I stepped out of that tent much warmer than when I entered it. I tested my ankle gingerly and found that I could put weight on it, maybe partially from the adrenaline I have to race as hundreds of runners continued to run by. I finished the 2018 Boston Marathon with the slowest marathon time in my life. However, when I look at my Boston Marathon medal each day, I can be proud to say that I finished the race. I persevered in the face of hardship. I kept going when others told me to quit. I accomplished something that most people will never have the opportunity to experience. What opportunities you have in front of you that needs to be finished? What goals, what business ventures do you have right now that need a little more focus, a little more determination, that have perhaps hit a rough patch? Maybe it’s time to pick yourself back up and finish the race. What a pity! Hope you do well next time 🙂 What I love when training for a marathon race is the discipline, planning, consistency, and hard work. All of this is required to build a business/niche site as well. p/s: My goal is to qualify for Boston marathon but it still far from it. Haha. In my country run a marathon just boom a few years. Great to have a new episode Spencer, love the use of the Boston marathon story very nicely done. My new site sounds like it is at exactly the same stage as yours – lets keep going!